The stream-lined, fat-free version of Facebook, Facebook Lite, has launched in the UK. There were reports today that the Lite version of the world's biggest social-networking site had arrived in the US and India, but now the URL http://lite.facebook.com seems to be working for the UK as well. The main things you will notice with Facebook Lite is how clean it is. It's mainly a list of status updates, picture posts and the like. It definitely looks like Facebook, but the feel of it is very much like Twitter. In a statement about the new version of the site, Facebook said: "Similar to the Facebook experience you get on your mobile phones, Facebook 'Lite' is a fast-loading, simplified version of Facebook that enables people to make comments, accept Friend requests, write on people's Walls, and look at photos and status updates. 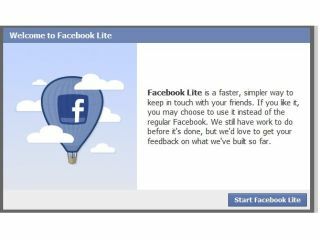 The statement continues: "We are currently testing Facebook Lite in countries where we are seeing lots of new users coming to Facebook for the first time and are looking to start off with a more simple experience." The main things of note which have disappeared include the suggestions box on the right-hand side, alongside the suggestion box. And there is no option to chat with your mates. There's also a complete lack of the more light-hearted aspects of Facebook – like the quizzes. But this can only be a good thing.